David Powers King: The WOVEN A to Z Challenge: D is for Dyer! The WOVEN A to Z Challenge: D is for Dyer! 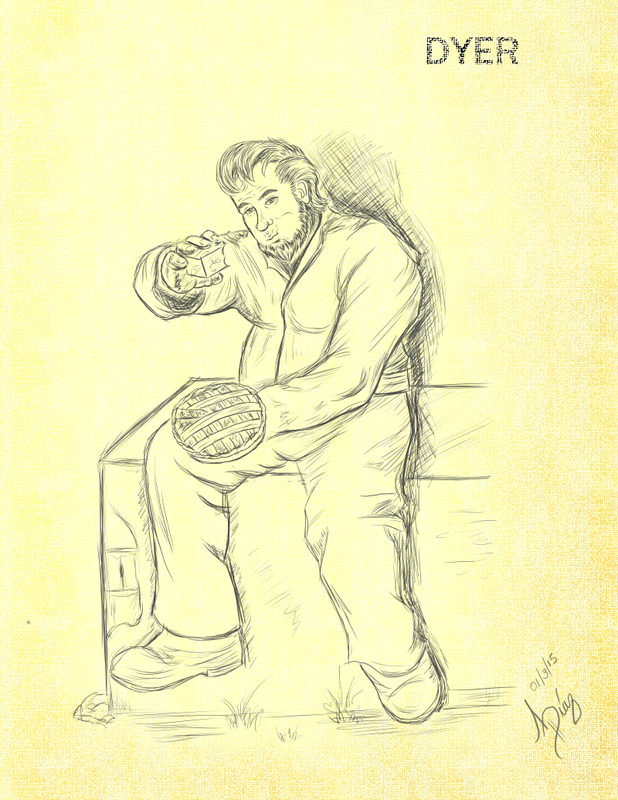 A gatekeeper and one of the night watchman for the city of Hillshaven, Dyre is a simple man with simple tastes. He is rarely suspicious and enjoys relaxing in the shade. He likes to eat cherry tarts made by a scullery maid who has a liking for him. He's reluctant to let Princess Tyra beyond the walls at night, but he knows better than to argue with her (click on the image to enlarge). I'm David, and "you carry a light load for business." And... we can't say anything beyond that about him. Again, another great drawing by Al. And in contrast, I'm always suspicious. :) A total waste of time. The princess may get the scullery maid to slip something toxic in the cherry tart one day so she come and go without being frowned upon. There goes my twisted mind again! Dyre will find dire consequences for his pie eating and laziness. Love the picture. Mmm, cherry tarts. He has good tastes. So cool, and that sketch is great! I need a scullery made that makes me cherry tarts. Or anyone, really. Nicely done. :) And I love the sketch. Love the picture. So cool to see bits of your world. Fantastic drawing, and the description gives us just enough to spark our imagination! Probably a hard worker, someone you can rely upon when hard work needs to be done. As always, a special bow to AL, for a job well drawn !! Dyer sounds like a reliable person. I love cherry tarts too. Another great sketch. Look forward to Eye of Needle on monday. It's the simple characters that get it in the end. But I so hope not. Great sketch! I love creating characters. It's one of my favorite things about writing. Happy Easter! "you carry a light load for business" that quote itself makes me want to read more! Love your theme - great sketches - thanks for stopping by my blog. He sounds lovely - really hope nothing bad happens to him! I love how you're bringing all your characters to life in these blog posts and drawings - definitely going to keep this in mind for next year's challenge! Being gatekeeper can't be easy. Cool sketch. I love all of the little stories within Woven.